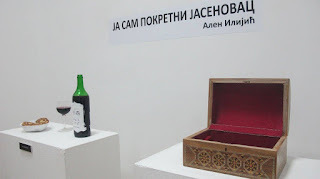 The exhibition ‘I am movable Jasenovac,’ by Alen Ilijić, is based on the theme of the largest concentration camp in the Independent State of Croatia, where Serbs, Jews and Roma were killed during World War II (1941-1945), but it is not conceived to be revisionism of historical events. It is focused on personal research, genetic affiliation (and thus racism), anti-Semitism and discrimination, current and past. Going back to his roots, Jewish, Romany and Serbian, Alen Ilijić Jasenovac perceives not only in a function of the place for collective suffering of his nations, but also symbolically, as a final assembly of the scattered graves of the artist's ancestors. In searching for identity and revealing long-kept family secrets, the exhibition brings the individual and universal truth about the burden caused by divided political beliefs about race. Elements of the camps, racism and anti-Semitism are also present in the previous Ilijić’s artistic engagements. For example, in the visual segment of the composition 'My suspicious look' a refugee number of the artists is shown ('PW503683d'). This number coincides with the marking mode of the people in the camp. ‘I am movable Jasenovac’ is a project that summarizes current Ilijić’s experiences, expressed through the art form of subjective witness. The commemoration of the Jasenovac’s victims and emphasizing discrimination, specifically Serbs, is in connection with the recent political turmoil in the European Parliament and adoption of the Resolution of Srebrenica. This multimedia exhibition is conceived of drawings, photographs, video-projection and ready-mades, as well as spectral composition which is created for the gallery space. The poetics of Ilijic’s gesture, on the neo-expressionistic drawings, ranges from the thin nervous line to aggressively implemented black surface, which brutally attacks our senses. In addition, the burden of genetic heritage is enhanced by the use of irradiation, whereby the stated artistic messages were brought to the candescence. One of the characteristics of Ilijić’s artworks is the use of symbolism with general and personal meaning. In other words, his symbolic dualism is distinctly his own, but also understandable to everyone. Thus, in the video-projection ‘Milica, my Savior’ shows in a metaphorical manner the author’s liberation from inner conflicts caused by racism and anti-Semitism. The ready-made ‘The taste and smell of the number 3’ consists of three objects, which, through the symbolism of unity, describe the taste and smell of the three nations. 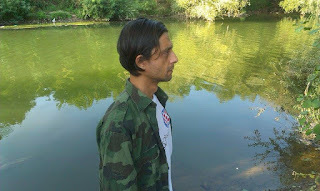 The project ‘I am movable Jasenovac’ reveals all the absurdity of negative stereotypes about the Roma, Jews and Serbs, which dominate in modern society. Going back to the past, to illuminate his own origin, Alen Ilijić has also made a step towards the future: towards equality, justice and dignity. * Ilijić's 'I am movable Jasenovac' was held at the 'KC Ribnica Kraljevo', in October, 2015.